Just like other parts of the home, bathrooms are just as important, if not more, when it comes to decorating and designing. Many people fear that they don’t have an eye for style, but if you make it an adventure decorating can become easy and enjoyable. Make a wish list- As you begin the brainstorming process of bathroom remodeling, create a list (on paper, on a web document, in your head) that includes features you like and donâ€™t like, such as the space around the toilet or the height of the sinks, and explain to yourself why so that you can retrace your steps down the road. 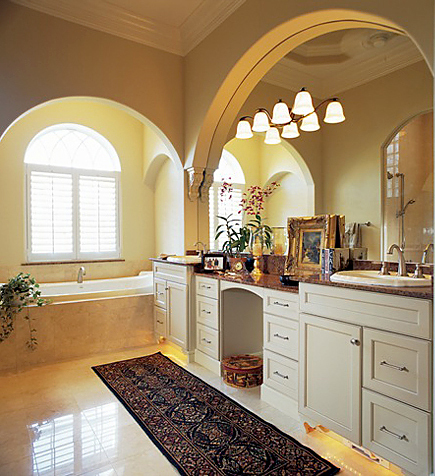 Decide what needs more attention in your bathroom versus minor modifications. If something isnâ€™t working properly, i.e. plumbing or lighting, make sure to hire the appropriate professional to avoid any disasters. Find inspiration in unlikely places- After the necessary work is put in, the decorating is the exciting part. It is important to find a theme and color palette that matches your style and invites you to spend time in your new bathroom. Think of some images or scenes you are surrounded by daily and discover what gives you a sense of tranquility. Do you prefer elegance, casual neutrality, or modernity? Themes you also may not usually be prone to choosing sometimes surprise you as well, so keep an open mind. Creative lighting- Choose proper lighting to enhance your tasks as well as match the overall theme. 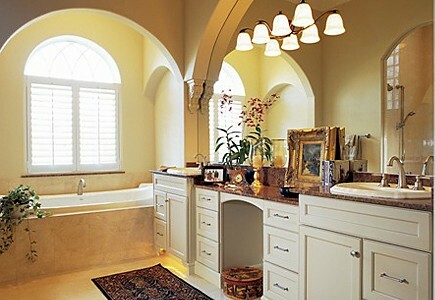 Think about reasons you spend time in the bathroom to help with lighting design. You may want to hang a chandelier overhead to createÂ ambianceÂ Sconces hung either on the wall or mirrors create stylish accent lighting or convenient task lighting, depending on placement. Halogen lights are used today for a more modern or industrial technique that create mood and task. Â No matter the styling technique, make sure there is enough luminescence to prevent you from falling out of the shower. Test the waters- Chances are it will be difficult to return a bathtub after it has been installed if it doesnâ€™t suit your style. To prevent any regrets, take a field trip to a few showrooms with displays. Have a feel for what it will look like in your future bathroom before you make a decision. Check out some of our work here! Create illusions- Use lights, mirrors, pastel paint colors, leading lines and other great techniques to create an illusion that your bathroom is bigger than it is. Positioning cabinets, mirrors and fixtures in certain places can offset the walls. Use suspended cabinets on wall space to free up room beneath them for double the storage and direct the eye to several places in the room.